Getting back into the swing of it every year can be hard. The best thing to do is not think about the swing much at all, but instead, the kick. The fastest way to feel gripped in the early season is to not trust your crampons, and the most common reason to not trust them is they just aren’t in the ice securely. This is why. Crampons have front points that are down turned so they have a positive bite. The result is, if you kick your foot at ice the same way you take a step, your crampons will glance downwards off your target. To accommodate their angle, we have to pick up our toes by bending at the ankle so the front points are facing out, or forward, like a little aggressive pod of weaponry. (I actually lift up my toes inside my boot as well.) You know you are doing it right when you are able to engage all points, including the secondary points, in vertical ice. Especially for those who climb in monopoints, doing this as often as possible will allow you to take full advantage of your crampons. That lone point frees you to take advantage of placements where two won’t fit, but without the added stability of the secondary points you’ll be wobbling around burning up your calves. Get those secondary points to make contact, the resulting tripod is super stable. When you set your crampon correctly and it bites nicely, leave it. The contact points should remain stable while the rest of your body moves around them. This might take some practice, or really, just plain old calf strength. 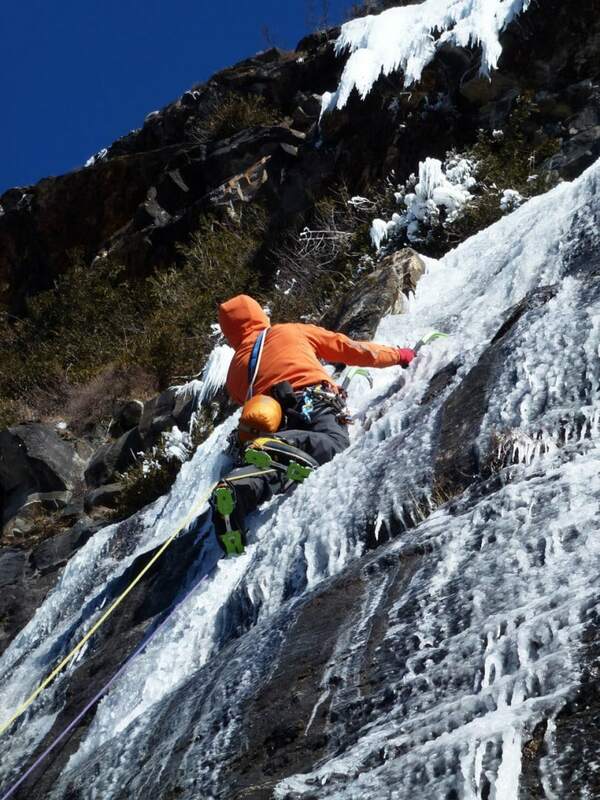 Stable, bent ankles on pitch 2 of Astroturf, Lake Willoughby, VT. Nick Bullock photo. Kick from the knee down! Don’t kick from the hip. When you kick with your thigh it is almost impossible to get your toes up enough to engage your front points correctly. Instead, bring your knee up as if you were taking a step on a staircase, and then, kick from the knee down (while flexing that shin muscle, all 3 or 4 front points aimed like little spears at your target). If you do this, you will find that you don’t have to kick as hard. When done correctly you should hear the sound of metal rattling, not the hollow thud of your boot. I’ve watched many people kick this way, thumping their boot at the ice and not getting any purchase. The logical reaction is to kick harder, but keeping your toes pointed up while you kick might save them from a beating by letting the crampon take the impact once, not your big toe over and over and over again. Practice the old school way. Set up a TR on a WI 2 slab and climb it without ice axes, front pointing. You might notice two things: (1) It is faster and (2) It is easier. Try it out on a WI 3, you’ll be surprised. An early season session like this will quickly make everything feel just a little less scary. Kick better, kick less and keep ’em sharp. Feel more confidant in the early season and you’ll have the rest of the season.